NASA is planning a mission to the moon, but there will be no humans or rovers to speak of. Their mission is to slam an impactor probe into the moon's south polar region. Although this seems like a rather destructive and barbaric mission, it actually has good scientific merit. The mission will be known as the Lunar Crater and Observation Sensing Satellite, or LCROSS. The premise for LCROSS stems from a discovery by NASA's Lunar Prospector that showed abnormally high concentrations of hydrogen in the Lunar south polar region. Scientists have speculated that the hydrogen could be associated with water ice locked deep under the Lunar surface. 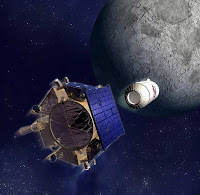 By impacting the surface at a very high velocity, the impactor can throw Lunar debris into space, where it can be analyzed further by the host spacecraft. The Lunar probe will be comprised of two main segments. These include the Shepherding Spacecraft, and the Centaur impactor. The Centaur impactor will weigh about 4,400 pounds (2,000 kgs). Once in orbit about the Moon, the Centaur impactor will separate from its host spacecraft and begin its descent towards the surface. The impactor will slam into the surface at a velocity of approximately 1.6 miles per second (2.5 km/s), and is expected to eject over 1,100 tons of Lunar dust. The Shepherding Spacecraft will then fly through this cloud of dust, and sample it using onboard sensors. LCROSS will be launched along with the Lunar Reconnaissance Orbiter on October 28, 2008. Impact is scheduled for February of 2009. I'll keep the site updated with any news of whether this event will be visible to amateur astronomers. I would imagine that one should be able to see it in moderate sized telescopes. This won't be the first time a space agency has punched a heavenly body, however. NASA's Deep Impact mission slammed into Comet Tempel 1 in 2005, and the ESA made a recent Lunar impact with Smart-1 in 2006. This recent trend toward violent impactors has some astronomers and scientists concerned, however. While good scientific data is obtained from such events, some believe that these missions are too destructive to their targets. Surely, a few more craters on the moon won't hurt, right? Superb publish. I wish to thanks with this educational study; I truly value discussing this particular excellent publish. Right now click here Cash Advance Continue your projects.